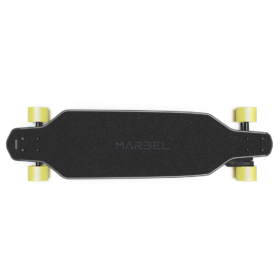 The Marbel 2.0 Single Drive electric longboard is built intentionally for high-density cities and campuses. The single belt-driven motor can reach a top speed of 26mph and can easily climb hills with an incline grade of 25%. The battery will get you as far as 18 miles range on a single charge and it only takes 90 minutes to fully recharge the battery which is one of the fastest on the market at the moment. The Marbel electric longboards come with built-in headlights and tail lights so you can easily be seen and see in low light.